A request shouldn't exceed the cost limit of £600 specified in the Freedom of Information and Data Protection (Appropriate Limit and Fees) Regulations 2004. Under section 12 of the Act, the Home Office is not obliged to comply with an information request where to do so would exceed the cost limit. We are therefore unable to comply with it. 2. Who was listening to Kate and Gerry McCann? 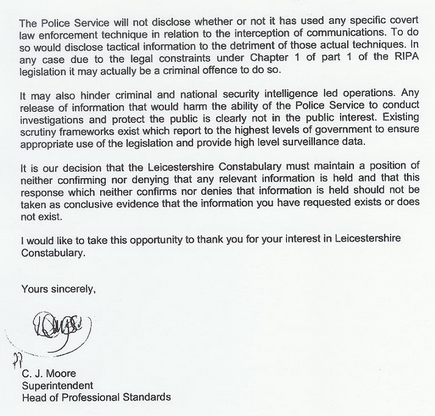 A few days ago I received an interesting letter from Leicestershire police about the Madeleine McCann investigation. I had asked them, in July, if they had got any warrants (under the Regulation of Investigatory Powers Act) to use surveillance powers - such as phone tapping and email interception on behalf of the Portuguese police. The force initially stalled saying it needed to "consult other Agencies" before replying. 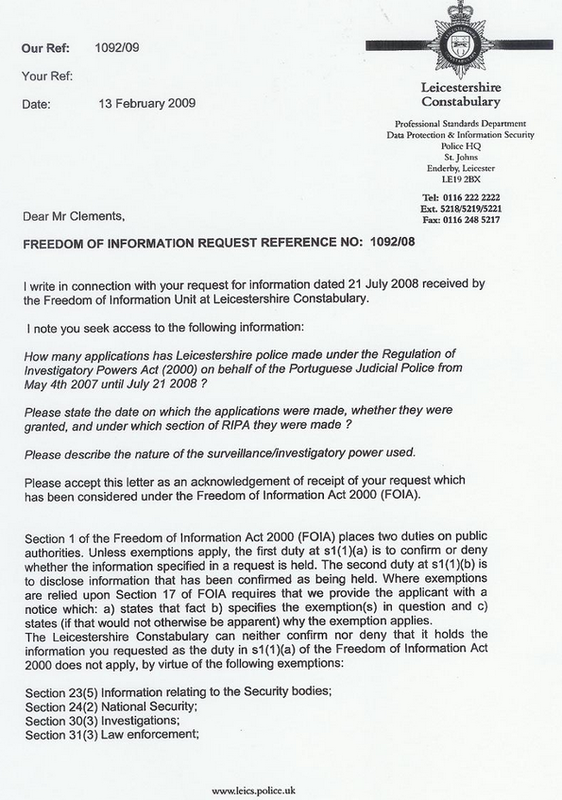 After a six month delay, Leicestershire has now claimed it is exempt from Freedom of Information laws in this case due to "national security". I've put in dozens of FOI requests to police forces over the years, some you get and some you don't but "national security" is a new one on me. To make matters even murkier, Leicestershire claimed a second exemption because the information I requested could relate to "the Security bodies". A quick look at the FOI Act reveals "Security bodies" are MI5, MI6, GCHQ (pictured above), special forces (such as the SAS) and the Serious Organised Crime Agency. 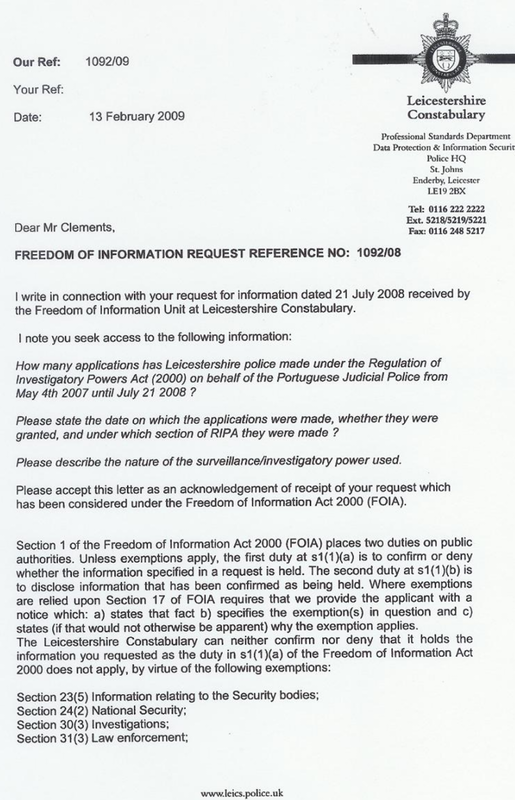 Despite claiming these exemptions, Leicestershire seem at pains to neither confirm nor deny they hold any information relevant to my request anyway. 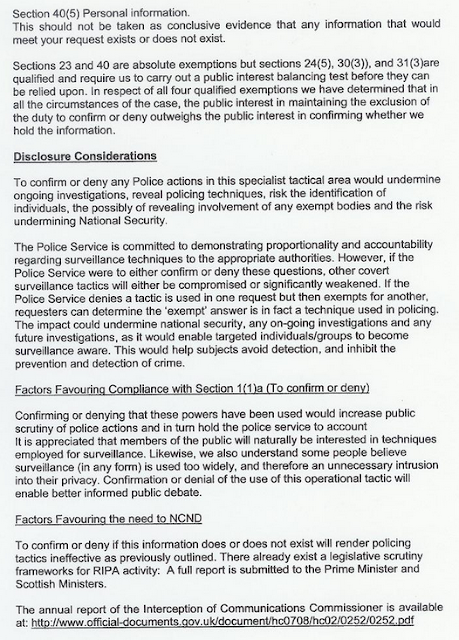 Check out (slowly I suggest) the tortuous conclusion to the three page letter explaining their stance. 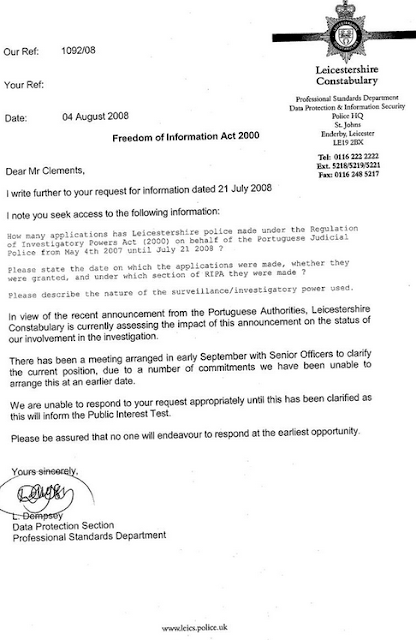 "It is our decision that the Leicestershire Constabulary must maintain a position of neither confirming nor denying that any relevant information is held and that this response, which neither confirms nor denies that information is held, should not be taken as conclusive evidence that the information you have requested exists or does not exist". Thanks, but I think that is a rather long-winded way of saying Foxtrot Oscar. However, it does beg the question just who was bugging the McCanns after they returned from Praia da Luz? And what has the answer got to do with national security? I've just spoken to the McCanns' spokesman Clarence Mitchell who has declined to comment. After all, you never know who's listening do you? Thanks for taking so much interest in my post about the McCanns and "national security". I have to say I'm a bit surprised that some of you think this proves that much about what happened to Madeleine, though. From my point of view, it suggests Kate and Gerry may, I stress may, have been subjected to an unusual - perhaps unprecedented - degree of surveillance after the returned to the UK. I'm not sure it indicates that much about what has happened to her and where she may be now. I've made some more inquiries and it it would appear that the most likely agency involved in any bugging would be the Serious Organised Crime Agency (Soca). They provide a lot of "technical assistance" to small police forces who don't have the skills or equipment to mount a major surveillance operation. As some of you have pointed out, they work closely with the Child Exploitation and Online Protection centre (CEOP) who carry out some very complicated and delicate operations against paedophiles. 5. McCann update: the deliberate mistake..? 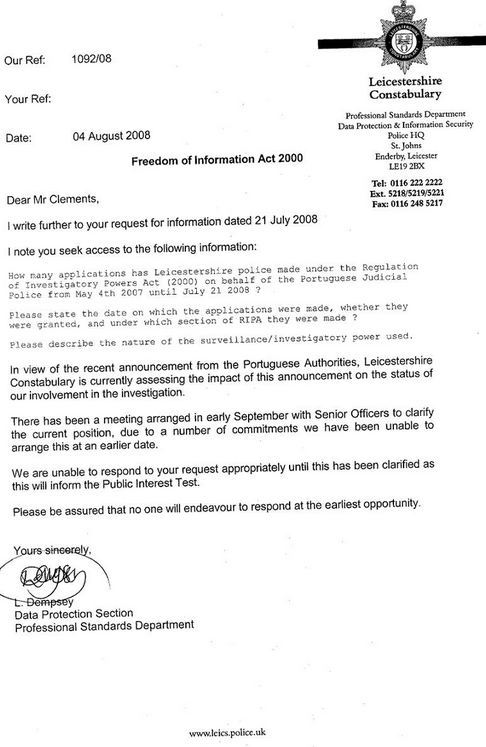 Forgot to post this earlier letter from Leicestershire police dated 04.08.2008, in which they acknowledged my request under the Freedom of Information Act. See if you can spot the unfortunate mistake in the letter. The individual concerned apologised for the error and I accepted their assurances it was a slip of the pen not anything else.